First it was Hugh F-W with chickens and this time around it Jamie O making the general public aware of pig welfare. Even though I deem myself to well read on various food issues the programme screened on Thursday night still surprised me. It may sound silly, but you just don’t think of pork being intensively reared, but it can be. It was good to see that the UK has a higher minimum welfare conditions compared to the rest of the EU, but these minimum conditions hardly produce happy pigs. This also means the supermarkets are flooded with cheap pork products that misleadingly appear to be from the UK, but are really from the rest of the EU where welfare conditions are poorer. Similarly, imported pig products that do not conform to UK law and/or common practice are sold alongside UK products in many stores. Not only are these welfare standards poor for pigs they are slowly killing the British pork industry as many consumers are choosing price over quality. For me, the most shocking part of the programme was the misleading labelling. Don’t trust the pictures and writing on the front of the packaging. Even if on the front of the packaging it says “UK sourced” don’t trust it. The only place to find out the truth is to read the back label. For example Wiltshire Cured bacon isn’t cured in Wiltshire, it’s cured using a cure called Wiltshire Cure and could be cured anywhere. For those of you interested in what exactly Wiltshire Cure it I found this . Not only was it about how pigs are treated, but also what happens to the meat after slaughter. Not mentioning any names but in one supermarket some pork steaks were found to contain only 85% pork. How a slab of meat can only contain 85% meat? That will be the classic trick of pumping meat with saline…mmmm nice. All of the programme made me very glad we get all of our pork from Packington Pork or from a smallholding friend where we know the pigs have had a happy, free-range life. It also makes me want to rear some pigs. Not right now as we wouldn’t be able to fit them in teeny tiny garden, but you never know, in the future. Hubby’s piggy visit to River Cottage has also cemented this notion. * clear and consistent labelling on pork products. * a better law to protect pig welfare. In a recent poll, only 2% of those questioned understood the terms used on pork products, such as ‘outdoor bred’ or ‘outdoor reared’. So what do the different terms mean? There is no legal definition of ‘free range’ when it comes to pork. Retailers can label the pork they sell as ‘outdoor bred’ or ‘free range’ without providing definitions. Although the perception that keeping livestock outside is best for welfare does not always hold true, free range systems in which pigs are kept throughout their lives outside in paddocks do ensure animals have freedom to move around and express natural behaviours. There is no doubt the term ‘outdoor bred’ sends out all the right messages to consumers who want to buy pork from pigs free to roam outdoors. However, despite the often held belief that this term means pigs will spend much of their lives living outside, in practice, the term is usually used to label pork from pigs that have only spent the first three or four weeks of their lives in free range systems. ‘Outdoor bred’ pigs are born outside, and their mothers almost invariably stay outside in paddocks throughout their breeding lives. However, once they have been weaned from their mothers, the piglets are moved into indoor systems, which can vary considerably in terms of the welfare standards they provide. ‘Outdoor reared’ is usually used to describe a system in which the piglets are kept with full access to the outdoors for up to around 10 weeks of age, before being moved to indoor rearing/finishing accommodation. Production of ’outdoor reared’ pigs on any commercial scale is relatively rare. 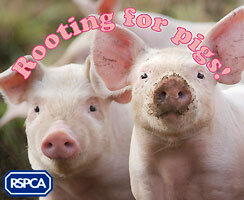 Go on, start rooting for pigs. 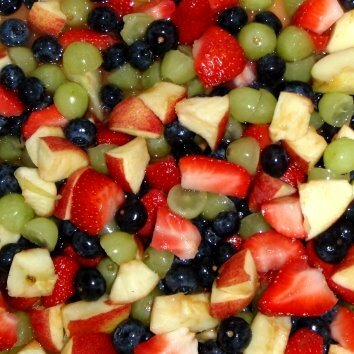 Abel & Cole recently contacted me asking if I would like to try one of their mixed fruit & veg boxes. Over the years we’ve had veg boxes off various people so I was interested to give Abel & Cole a try. The box contained potatoes, carrots, leeks, onions, mushrooms, salad tomatoes, savoy style cabbage, apples, clementines, mangoes, bananas. Most of the veg was turned into Ham & Leek pie and a lasagna leaving me with some potatoes, carrots and onions. It was then I decided to make Scouse. Incidentally they are the first company I’ve come across who deliver my favourite beer! Scouse is a dish, originating from Liverpool, that I’ve been meaning to make for a while and it seemed like a perfect dish to not only use up the veg but to also christen by my Le Creuset dish. My teenage years were spent growing up a stone throw for Liverpool and quite regularly picked up portions of Scouse from the local bakery for lunch. Although the dish had begun to die out over the last few years, I noticed on my last visit to Liverpool it is appearing on menus again. It is this dish that Liverpudlians (aka Scousers) are thought to be named after. There is different variants of the dish depending on where you are and who you speak to. 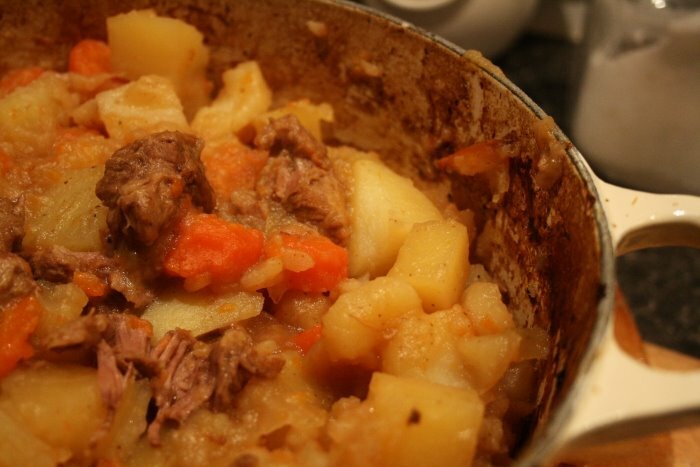 Scouse is a lamb/mutton stew from Liverpool and was originally brought to Liverpool by North European sailors who called it Labskause. It’s what we would now call a peasant dish using cheap cuts of meat and basic veg. Blind Scouse is the same dish, but without the meat and Lob Scouse (or Lob Skows) is more from North Wales and uses beef rather than lamb or mutton. It’s by no way a posh looking dish, but it certainly fills you up. 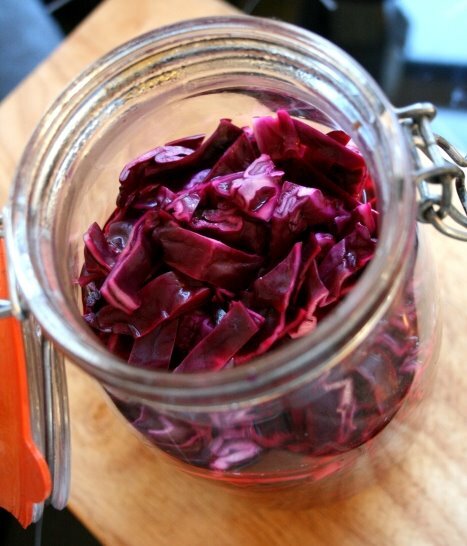 Traditionally you eat it with pickled red cabbage, which gives the dish some bite and tartness. This is also an exercise to prove to Hubby that Liverpool does have a famous dish, which at the moment he refuses to believe. I can see his point as I don’t think I can name a single other famous dish from Liverpool, unless and chip butty counts! He wants to call it a hotpot, but I tried to explain calling Scouse hotpot is like calling Beef bourguignon a Lancashire Hotpot. 1) Preheat the oven to 170oc. In a deep casserole dish heat the oil then brown the lamb. Remove the lamb then fry the onions for a couple of minutes. Return the lamb to the pan then add the carrots and 500g of the potatoes. Add a dash of Worcestershire sauce and 500ml of the stock. 2) Place the covered casserole dish in the oven for 2 hours. Stir every hour. Once the 2 hours are over stir in the remaining potatoes. By this point the potatoes that went in at the beginning will have begun to disintegrate and thicken the sauce. Add the remaining stock (if needed) and put back in the oven, covered, for a further 2 hours. 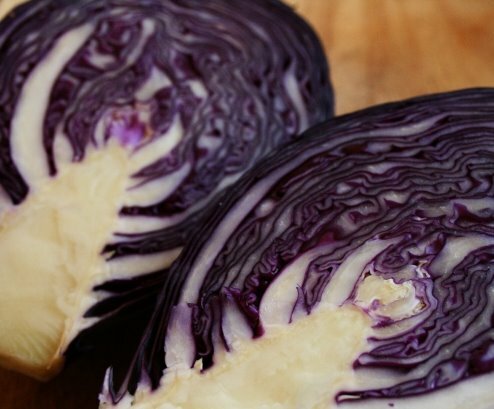 Serve hot with picked red cabbage and crusty bread. We’ve now taken down the Christmas tree. The cottage looks so empty without it, and the other decorations. After a day of the fire burning the cottage it has just about warmed up. As the cottage doesn’t have central heating we can’t set it so we have a warm house to get home to. It’s a case of once we get home after a few days away, getting a fire going (which never lights as well in the cold) and sitting it out until it is warm, in amongst layers of fleecy blankets and copious warming cups of tea. It was a bit of a surprise when we awoke yesterday morning, to get ready for the first day back in work, to find a blanket of snow coating the ground. We’ve been predicted more snow in the next few days. 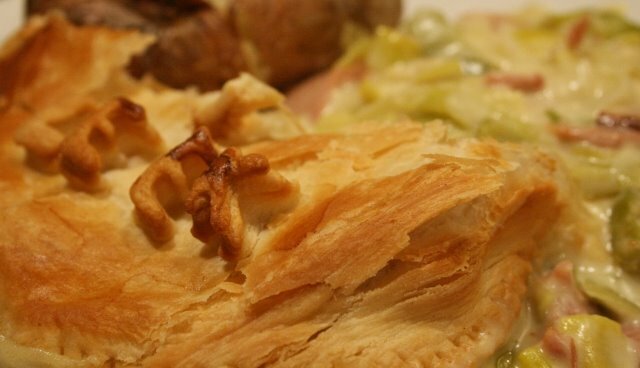 Cold wintry weather like this requires comfort food of the puff pastry kind…pies. I know you can make pies with different pastry, but for me the perfect pie is a pie full of filling, with a decent amount of sauce and a puff pastry lid. A few days after Christmas the leftover ham was reincarnated into a Ham & Leek pie and as requested by the lovely Charlotte @ The Great Big Veg Challenge here it is again. In theory you could make this pie with a multitude of leftovers, just don’t forget to briefly cook the veg before you add it to the pie. In the first pie I made a few days after Christmas I added Green Thunder to the cheese sauce which was absolutely delicious. 1) Preheat oven to 200oc. Gently fry off the leeks in a small amount of butter until softened, stir in the ham then take off the heat while you prepare the sauce. 3) Gradually bring the sauce to the boil, stirring all the time to stop it burning. 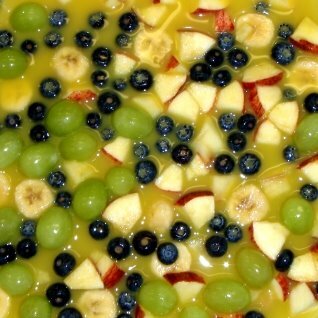 Simmer the sauce until it has thickened. Take off the heat, remove the bay leaf then stir in the cheese and mustard powder. Season then add to the leeks & ham. 4) Pour the cheesy leek mix into the bottom of a deep ovenproof dish. Roll out the puff pastry to the size of the dish. Place the pastry on top of the leeks and place 2 slits in the pastry (this stops the pastry going soggy). Brush the pastry with either the milk or eggs then bake for 25-30 min, until pastry is risen and golden. We manage to pack so much into the 2 week-long festive break, but at the same time it was really relaxing. Most of it was spent catching up with friends, seeing the sights and indulging in some fantastic food and drink. First stop was Bristol to stay with some good friends and their crazy, lovable cat called Simba. First night we went to their local to try some proper cloudy Somerset Cider. It was far too strong for me but Hubby, bless his big cotton socks, enjoyed a few pints of it and it sent him totally wappy. I think I may have temporarily disowned him on the way home after I spotted him wearing a traffic cone on his head. Previous years when we have gone for New Years we’ve all struggled to stay awake (we’re becoming lightweights! ), so this year made a conscious effort to stay awake…and that we certainly did. On NYE we dined on delicious Beef Wellingtonfollowed by a delicious cheese board and sampled various Ports while watching the Sky Lanterns people had set off throughout the village to bring in the New Year. 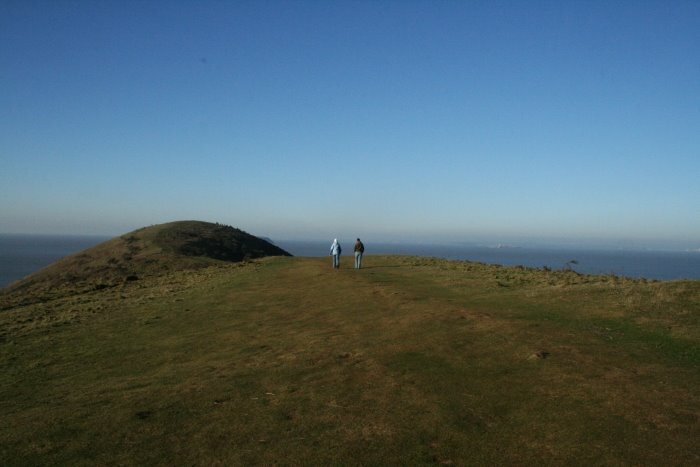 Finally on the 2nd we headed out to Brean Down to the south of Weston-Super-Mare (as shown in picture above). After a short climb to the top, in which my legs were quite adamant they weren’t going to do, the view was spectacular, if a bit windy and cold. We must have spent an hour or so at the top admiring the views. The climb certainly dusted off some cobwebs. This evening, after a long journey north trying to avoid the chaos of the M6 we eventually returned to our very cold cottage, the thermometer in the kitchen read 7oc…brrrrr. I think we’ll be having a constant fire burning for the next 24 hours to warm the cottage back through. Thank goodness for hot water bottles! * Acquire better knife skills, ask me to finely chop something…you can forget it. * Also keep an eye out for River Shed HQ…Hubby’s self-entitled project. So with 305 items on Google Reader and Delicious, Fresh & Jamie Magazine to catch up on I bid you a great 2009 and I hope it is a fantastic foodie year.